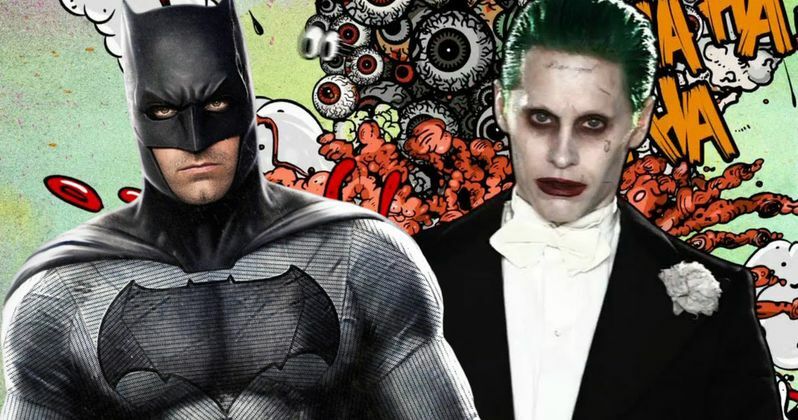 Suicide Squad Toy Reveals Huge Batman Vs Joker Spoiler? With Comic-Con in full swing, fans have been hitting the convention floor since Preview Night last night, and a number of photos have already surfaced online. Today, we have a few particularly intriguing images of new Hot Toys action figures from Suicide Squad featuring The Joker. The Joker is seen wearing a unique costume that will certainly raise some eyebrows. The photos surfaced from a number of different Twitter users, which shows The Joker wearing his own, much more colorful version of the Batman suit. Ever since the photos started circulating last night, fans have wondered if one of Suicide Squad's big secrets has been spoiled. Toys and other merchandise from various other movies over the past few years have been known to give away big secrets. One source tells Batman-News that this "Joker Batman" isn't featured in the movie, though. Which might be too bad if true. In addition to these photos, we also have the latest video in a series of character profiles showcasing each member of Task Force X. Fittingly enough, this video showcases Jared Leto's Joker. The video offers some never-before-seen footage of Ike Barinholtz's mystery character, who is revealed to be a prison guard seen flirting with Harley Quinn while she's locked up. The Joker finds out about this, and confronts the man, telling him that he can't wait to show off his "toys." We reported earlier this month that Suicide Squad is eyeing a huge opening weekend at the box office, which some analysts are predicting could top $125 million. That number falls just shy of Deadpool's $132 million and Batman v Superman's $166 million, but it's still an impressive number. We'll have to wait and see if Suicide Squad can match or surpass these lofty expectations when it hits theaters on August 5. Jared Leto's The Joker is joined by Margot Robbie's Harley Quinn, Will Smith as Deadshot, Joel Kinnaman as Rick Flag, Jai Courtney as Boomerang, Viola Davis as Amanda Waller, Cara Delevingne as Enchantress, Ben Affleck as Bruce Wayne, Adewale Akinnuoye-Agbaje as Killer Croc, Raymond Olubawale as King Shark, Jay Hernandez as El Diablo}, Common as Monster T, and Adam Beach as Slipknot. David Ayer directs from his own screenplay, and there are already rumors that Warner Bros. wants David Ayer to come back and direct Suicide Squad 2, which the studio wants to start shooting in early 2017. Take a look at these new Joker Hot Toys photos, along with this new preview featuring The Joker.